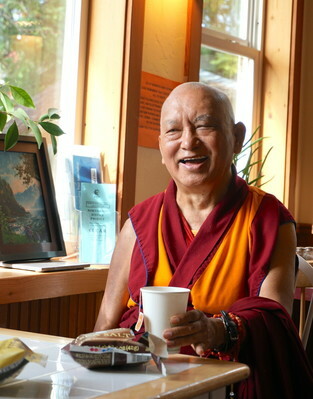 Advice and stories about developing compassion, the good heart, sent to a student who had been offering healing classes at a center for twenty-five years. Thank you very much for your kind letter, and yes, now this is the twenty-fifth [year]. The time has gone so fast; it’s like a short time ago. I want to offer a billion, zillion, numberless thanks to you for following my wishes and advice in taking this healing meditation class. As you know, remember how we did the first course, not only taking care of the body but also taking care of the mind, where all the problems come from. Mental and physical, samsara and nirvana, enlightenment and hell, happiness and problems, all come from the mind. That is the creator. In the world many people believe [they were] created by God, and people with little intelligence say suffering is created by God to punish them. My question is: if God didn’t create sentient beings, then God doesn’t have to punish them, so why do they suffer? Maybe God felt lonely if he didn’t create sentient beings. Is the gateway leading to infinite qualities. More than my life, even should they rise up as my enemies. This is the best Dharma practice to help others and the best meditation, the best way to practice, the best healing. To develop the good heart and let them practice this is the best psychology, the best meditation, the best Dharma, the best everything. It is the quick way to achieve enlightenment, the quick way to free sentient beings from obscurations and bring them to full enlightenment quickly. Below are two stories, examples of this. There are many other stories, many that I don’t know, these are just examples. Asanga meditated in a cave for twelve years and tried to achieve Maitreya Buddha, but nothing happened. After twelve years he came down and saw a wounded dog covered in maggots on the road. He felt unbearable compassion, so he cut flesh from his thigh in order to pick up the maggots and put them on his flesh. He thought if he picked them up with his fingers he might hurt them, so he thought he must pick up each maggot with his tongue. He closed his eyes and stuck out his tongue to pick up the maggots. Suddenly in front of him was Maitreya Buddha, not the wounded dog. Before, his mind was obscured and he only saw a wounded dog, but after generating unbelievable compassion he purified so much negative karma he had collected in the past. It was unbelievable purification, by generating compassion, and then he was able to see Maitreya Buddha. He immediately grabbed Maitreya’s robes and asked Maitreya Buddha why he had not come sooner, as he had tried to meditate for twelve years in the cave. He asked why he hadn’t seen Maitreya, and Maitreya Buddha replied, “I was there the whole time, but you could not see me. You know the place where you spat in the cave? That’s where I was.” Then Maitreya showed him the stains of spit on his robes. The other story is about the great yogi Ngagpo Chöpawa who was going to Odi for the tantric practice of action. On the way, near the river, he saw a lady who was completely black in color, covered with leprosy and with pus coming out of her sores. She could not walk and asked him to take her across the river, but he ignored her. After some time, his disciple Getsul Tsimbulwa came. He was not a gelong but a getsul, with thirty-six vows. The woman asked him the same thing, to take her across the river. Even though he was a monk and was not meant to touch women, he felt unbelievable compassion the minute he saw her, and immediately carried her across on his back. Because he generated unbelievable compassion for her, even though she was dirty and covered with leprosy, even without crossing the whole river, his negative karma was purified and in the middle of the river he saw her as Dorje Pagmo, an enlightened deity and she took him to the pure land of Dagpa Kachö. Since our mind is ordinary, obscured, there are many things we see as ordinary, when they are not. Please think about this and please also show this to ___, so she can understand how important it is to help from the heart. Please enjoy. I hope you enjoy the cards.